Singer Taylor Swift won the Best Female Video award at the 2009 MTV Video Music Awards in New York on Sunday. The 19-year-old songtress won the Best Female Video award for You Belong With Me. But her excitement of winning the award was marred by Kanye West when he jumped on stage and stated that Beyonce Knowles should have won. As she started her acceptance speech, West, who had been drinking Hennessy on the red carpet appeared on stage and stated that Beyonce should have won for Single Ladies (Put A Ring On It), reports Usmagazine.com. 'Yo, Taylor, I'm really happy for you, and I'm going to let you finish, but Beyonce had one of the best videos of all time. One of the best videos of all time!' he said. Swift and Beyonce, who was in the audience, were left stunned and speechless. The crowed then booed West off stage. Beyonce won Best Choreography for Single Ladies too. Lady Gaga bagged the Best New Artist award. 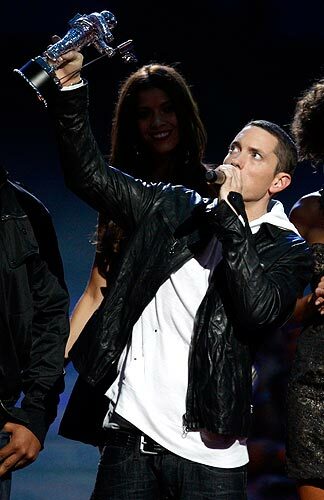 Controversial rapper Eminem won the spaceman as well for Best Hip Hop Video for We Made You. 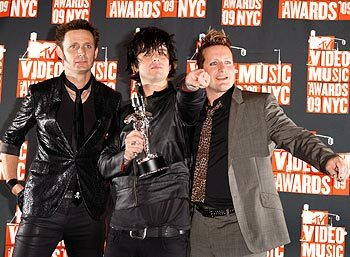 Green Day band members pose with the Best Rock Video award for 21 Guns. Why searching for Ash can harm your PC!